The Subaru Forester has been upgraded for 2016 to ensure the model maintains its status as one of the most capable and versatile SUVs in its class. The 2016 model-year upgrades to the Subaru Forester – the Japanese manufacturer’s bestselling model in the UK – result in improved safety, convenience, comfort and refinement. The upgraded Subaru Forester will go on sale across the brand’s UK dealer network next month. Pricing remains unchanged for all trim levels in the updated Forester line-up, with the range starting from £25,495 (on-the-road) for the 2.0i XE model and £26,995 for best-selling 2.0D XC models. 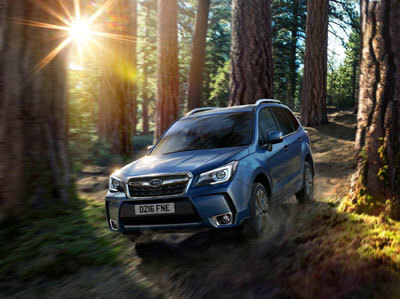 Every Forester is equipped with two core Subaru technologies: Symmetrical All-Wheel-Drive, affording surefootedness in all conditions; and the latest-generation four-cylinder ‘Boxer’ engines, contributing to the low centre of gravity beneficial to balance, road holding and handling. The 2016 Subaru Forester has had an exterior and interior refresh. At the front of the car, the Forester’s distinctive hexagonal grille has been updated with a new ‘wing’ motif grille mesh, while the front bumper has been reshaped and now features new L-shaped chrome trim adding greater visual volume to the lower part of the Forester’s ‘face’. The change is designed to emphasise the car’s relatively low centre of gravity, wide stance and innate stability. The wraparound headlamps – retaining Subaru’s signature ‘hawk-eye’ shape – feature a new black base paint finish for a sharper appearance. The 2016 model is also fitted with new LED combination lamps at the rear. Inside the cabin, new materials and technologies have been introduced to further modernise the interior and introduce a higher-quality look and feel, while still retaining the functionality for which the Forester is renowned. The interior is finished with a higher proportion of soft-touch materials, new piano black and metallic trim, higher-resolution TFT displays and new cloth and leather upholstery options – including a new brown leather option. Following the adoption of Subaru’s new 7.0-inch touchscreen infotainment and navigation system in 2015, the changes to the 2016 Subaru Forester are designed to further improve the quality look and feel of the cabin. A series of modifications have been made beneath the surface of the 2016 Forester to greatly improve cabin refinement. Thicker glass has been applied to every door and the front quarter lights at the base of the A-pillar, reducing the ingress of wind ‘rush’ and other noises into the cabin. For the front quarter lights and front doors, glass thickness has increased from 3.5 mm to 4.0 mm, while rear door glass is now 3.5 mm (up from 3.1 mm). The seals around the window frames in the doors use a new, more sound-absorbent material to further reduce noise levels. Additional soundproofing material has been added around the dashboard, particularly where the dashboard meets the base of the windscreen and in the front passenger foot well, minimising noise intrusion from wind rush and the engine, respectively. Already an exceptionally safe vehicle, the 2016 Forester adopts new headlamp technologies which include LED lights with Adaptive Front Lighting System. The new Adaptive Front Lighting System allows the headlamps to rotate left or right into corners as the driver turns the wheel. By illuminating the road ahead in the direction in which the vehicle is traveling, the Forester’s night visibility is greatly improved, particularly useful in poorly-lit rural areas. All existing safety equipment on offer is fitted as standard to every model in the Forester range, including twin front, side, curtain and knee airbags, Subaru Vehicle Dynamics Control (VDC; Subaru’s electronic stability control system) with trailer stability, and Subaru’s hallmark Symmetrical All-Wheel Drive technology. The 2016 Subaru Forester features a range of modifications to improve ride quality and agility, and ensure greater refinement for passengers. Updated suspension settings at the front and rear ensure the car remains comfortable and refined, particularly over broken or choppy surfaces, while the adoption of a new steering gearbox quickens the steering ratio (from 15.5:1 to 14.0:1) to improve reactions to steering inputs. The range of engines remains unchanged for the 2016 Forester; buyers can choose from three 2.0-litre horizontally-opposed four-cylinder engines – a 150 PS naturally-aspirated 2.0i petrol engine and a 147 PS 2.0D turbo-diesel unit from Subaru’s FB family of engines, and a 241 PS direct injection turbocharged (DIT) petrol unit, engineered for high power, responsiveness and efficiency. A six-speed manual transmission is fitted as standard to 2.0i and 2.0D models, with an optional Lineartronic CVT automatic transmission. Lineartronic is standard on XT models, equipped with the 241 PS DIT petrol engine. In uneven or slippery road conditions, the all-terrain capability of the standard Symmetrical All-Wheel-Drive is enhanced further with the X-Mode on Lineartronic CVT models, a control system which includes Hill Descent Control and makes traction even better than the outgoing model’s. There are a total of nine models in the 2016 Forester range, starting at £25,495 for the 2.0i XE and £26,995 for 2.0D XC models, and rising to £30,995 for high-powered 2.0 DIT XT versions of the car. The upgraded Subaru Forester comes with the brand’s comprehensive five year, 100,000 mile warranty. To find out more about the upgraded 2016 Subaru Forester, visit subaru.co.uk.